It's been a while since the last blog, and boy, have we had our hands full... of babies! Patients are pouring in left and right, we're quickly approaching our 200th patient of the year, and it's only the middle of June! We are knee-deep into baby season here at REGI. The early warm weather stirred up some love bugs in the air, and nestlings and fledglings of numerous species have found their ways into REGI's clinic. Wood ducks, Eastern pheobes, robins, flickers, barred owls, great horned owls, and a bald eagle have already graced REGI's clinic... and we still have a lot of summer left. These American kestrel nestlings are some of REGI's most recent patients. This brother and sister pair are rapidly growing nestlings. Just like a younger human child, these nestlings are too young to leave the nest, and are still being watched closely by their parents. Although they look white and fluffy now, make no mistake, someday they will be big, tough raptor parents! This American kestrel fledgling was born several days before the nestlings shown above. Ready for her first flying debut, she was in the process of leaving her nest for the first time and landed into a pile of manure. It wasn't the most graceful first flight, but her prognosis is great (only a little smelly), and is headed home soon! This Saturday (6/16) is our Wild Birds Unlimited Baby Bird Shower in Wausau, WI. There is a playpen in the store set up for donations to our baby birds! REGI's very own education birds will be making a special appearance at 1:00pm! Wild Birds Unlimited's continuous support for REGI continues to inspire our staff and save our patients lives. 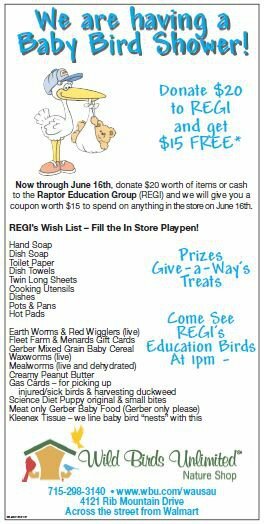 Join us this weekend and receive a $15 Wild Birds Unlimited gift card with every $20 donation to REGI's baby birds! How neat is that! Below is our ever-changing wish list, add to that some used children's toys... our crows are always looking for new enrichment opportunities. Our interns are well into their third week of a crash course in avian rehabilitation, ecology, biology, and education. Here at REGI, we welcome interns with open arms, and this year is no exception. This summer we are joined by 5 interns and a wildlife veterinarian from Turkey! Interns and volunteers are a HUGE help to REGI. Babies in the clinic are fed every 20 minutes from sun-up to sun-down, and this would be nearly impossible without the help of our great team of interns! Now's the chance for you to get to know our interns, I'm sure they will be gracing the blog several times within the next couple of months. Why a REGI internship? Eventually, I would like to be a wildlife rehabilitator focusing on avian species. What bird would you be? Why? Peregrine falcon, I think it'd be great to be considered the fastest animal on the planet, it'd be an honor! Favorite childhood toy? The stilts! I was up on stilts by age 6, and was able to attend a circus school for a summer! Why a REGI internship? I'd love to someday be a wildlife rehabilitator, and this seemed like a great, hands-on place to get some experience! Favorite part of REGI so far? Working up close with so many different species of birds. What bird would you be? Why? Puffin, they just seem to live in some pretty awesome places! What is your favorite childhood cartoon? Bugs Bunny, it's the best cartoon ever! Why a REGI internship? I was looking to make a difference in my internship and REGI seemed like a wonderful place to do that. Favorite part of REGI so far? Handling the education birds and being so close to the wild patients. What bird would you be? Why? Barn owl, I'd love to be able to scare people into thinking I was a ghost! What would I find in your refrigerator right now? Leftover mac n' cheese and pretzels. Yum! Why a REGI internship? I have always wanted to work with animals, and I have heard great things about REGI from all of my college professors. It's also just awesome. Favorite part of REGI so far? Watching the patients from admission to release. Each of their stories are so different and compelling. I've also enjoyed bonding with my fellow "intern shipmates". What bird would you be? Why? Penguin, they are always dressed so classy. What is your favorite color of clinic gloves? Bright purple! Why a REGI internship? I'd like to keep my options open in the future, and I spent time as a volunteer last year! Favorite part of REGI so far? Watching the baby birds grow everyday! What bird would you be? Why? Goldfinch, they are just so beautiful, light up any bird feeder, and everyone could hear my song! What is your favorite color? Yellow, it's the color of the sunshine (and goldfinches oddly enough!). Why come oversees to REGI? Experience wildlife rehabilitation up close and personal with all of the birds, I hope to learn techniques to continue my wildlife veterinary positions in Turkey. Favorite part of REGI so far? Treating all of the injured birds. What bird would you be? Why? Kestrel, they are so cute, yet so wild. What do you miss most about home? My boyfriend, I am only able to talk to him for a few minutes every day. I hope to see you all in Wausau, WI this Saturday at 1:00pm to come meet our education birds! Bring some Kleenex, kids toys, or meaty Gerber baby food (no ham please)! The birds thank you! Stay tuned to the blog for more updates, and enjoy the summer heat wave for us, we've been in frost advisories the past several nights.